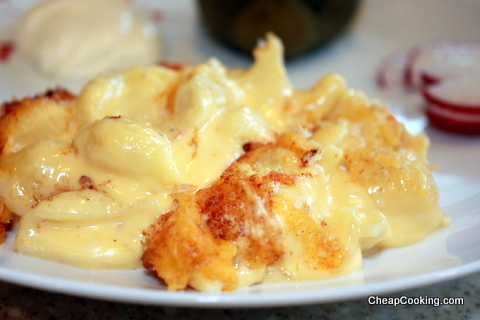 I thought this crockpot macaroni and cheese would be a great way to have a hot kid-friendly dish at a large party. Then I noticed how many adults were dipping into it, too! I was skeptical the first time I made this, thinking it would get runny and watery and that the pasta would just fall apart. I was quite pleasantly surprised that it holds together and tastes great! In fact, this is now my oldest daughter’s favorite version of macaroni and cheese. Cook and drain the macaroni. Turn the Crockpot on low. Add the cooked and drained macaroni, the two different milks, salt, melted butter and all but 1 cup of the shredded cheese. Stir together, then sprinkle the rest of the cheese on top. Cover and cook 2-4 hours. Check a bit before your party and if there’s too much liquid on the bottom, stir it together.